Morton Bakar Center Makes Learning Fun Through Skillympics! Congraulations to Morton Bakar Center for completing their first “Skillympics” (Skill and Olympics) event! What are the Skillympics? Great question! It is a unique and FUN way to educate staff in all aspects of Morton Bakar’s policies, procedures, and many state and federal regulations that are critical to the proper management of the facility. The goal is to make learning fun, engaging, and competitive. Like the Olympics, there was a torch and a parade. However, in true MBC style, they were exclusive in the series of competitive academic events. The events were managed and graded by the department heads. The winners were awarded gold, silver, and bronze medals based on academic and skills performance. Each employee had the opportunity to interact with all departments, gaining critical knowledge and skills throughout the process. This event will now be held quarterly. The goal is also to prepare employees for the annual state and federal survey by having each employee be academically competent and engaged. The Skillympics is also intended to be a staff development and team building event! The holidays were made a little sweeter by Medical Records Technician Tamera Simonson who surprised Clark County Telecare staff with personalized stockings. Tamera embroidered staff members names on the stockings and thoughtfully chose different material to match each staff member’s interests. She sewed a total of 52 stockings. Staff were delighted and touched by her kindness and continued the spirit of generosity by filling the stockings with small gifts, candy and cards. Many stockings were overflowing with treats, which goes to show that Telecare staff truly appreciate and celebrate each other. Telecare Atlas / TABS / AOT rang in the New Year with our New Year, New You Transformational Resource Fair on January 29th. Thirty-four agencies across LA County came to support the event and provided participants with a variety of information on educational, vocational, and benefits opportunities. Several members also received haircuts, free phones, signed up for medi-cal, and obtained glucose/blood pressure/HIV tests. Members were given post-its to help write their hopes and dreams for the New Year and pleased to interact with the variety of different community programs. A special thank you to Nick Shepard, Andrea Major, Rayzhone Davis and our wonderful support staff for helping organize the event. Sanger Place Celebrates Telecare’s 50th! Wrapping up a party-filled 2015, Sanger Place in Fresno County celebrated Telecare’s 50th anniversary (and the programs fifth!) with a big party for their staff. Thank you to the party planners and all the staff that made this event special! 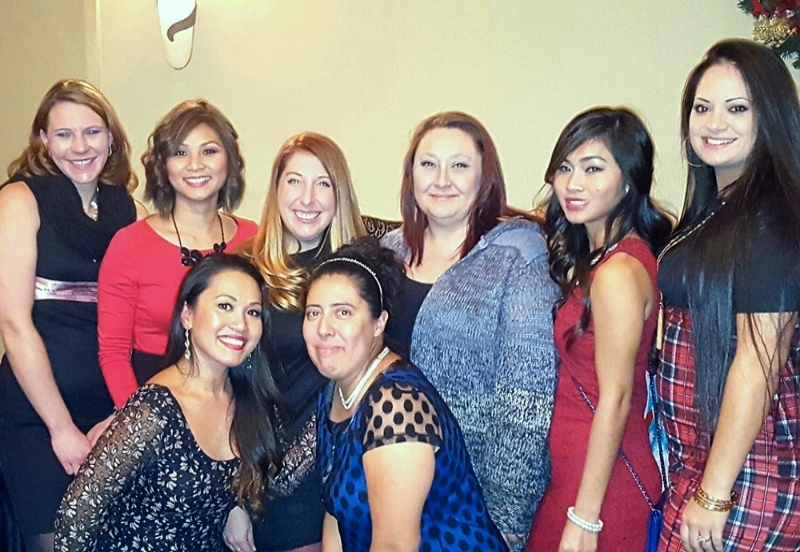 2015 was a wonderful, interesting, and exciting year for our San Joaquin Telecare family. First, I would like to express my deep and sincere appreciation to our Jeremy House family for the amazing team work, dedication, passion, and commitment to the day-to-day work that they do. I am grateful for the beautiful uniqueness in each of our members and the diversity that we all continue to learn and embrace. It’s the hard and heart work that is given to the program and the residents from each member of the team that makes us great in our ability to serve with passion, compassion, and quality. Thank you from the bottom of my heart for being the awesome team you are! To our sister program, TEIR, I’m looking forward to the incredible journey ahead. Our TEIR team is tiny, but very mighty. Thank you for your eagerness to learn and your dynamic energy. We are rockin’ and rollin’! Go Team! Special thanks to the wonderful and awesome communications team. Thank you for all your help and the goodies throughout the year. Thanks for keeping us informed and in the loop. Another special thanks to the IT team. You never failed us! To the entire Telecare family, we would like to wish you and yours a very happy, safe, and stress-free holidays! And the Winner Is... The Morties! This year, in honor of our 50th anniversary, we invited all of our programs to share their stories of recovery, values, and inspiration. We would like to say a huge thank you to all of the programs who put their time, effort, and love into this contest. Take a look at the videos below to see who will be bringing home The Morty, an award created in honor of Anne Bakar's father and one ofTelecare's founders, Morton Bakar! Telecare staff and members of our inpatient program in Hayward, California, share what recovery means to them and what they are most proud of in their life and work. Our community-based program in East Oakland showed their heart, spirit, and all the unique ways they are incorporating the Telecare values and Evidence Based Practices to improve the lives of the members they serve. Telecare members and staff in our court-ordered program in Orange County share their stories of making it through hardship and give words of hope and encouragement to those on their own recovery journey. In honor of the victims from the tragedy that occurred in San Bernardino December 2, San Bernardino ACT, MAPS, TIE-CC staff and members expressed their sympathy and condolences by visiting the memorial site leaving words of support and encouragement. Happy Veteran’s Day to our special LVN Malcolm Edrada. Malcolm served in the U.S. Navy for 10 years as an Engineering Mate. He served on five deployments to the Western Pacific areas such as Singapore, Japan, Philippines, Malaysia, Indonesia, and Australia– just to name a few. One of his greatest accomplishments was when Malcolm was awarded an ESWS pin. This pin is a surface warfare insignia that is a military badge of the U.S. Navy and issued to personnel who are trained and qualified to perform duties aboard surface warships. When Malcolm was in San Diego, he was “volun-told” to join the Naval Security Force, also known as the Naval Law Enforcement, and he shined. They recognized his talents and Malcom graduated with honors out of a class of about 50 students. Malcolm had an average of 97.5%. When Malcolm left the U.S. Navy he took about a year off until he decided to become a nurse — LVN. In January, Malcolm will have worked four years with us. We are honored to have such a kind, courageous, and patient man working with us. Malcolm is the epitome of a great nurse. Happy Veteran’s Day to Malcolm and all the men and women that serve our country, past, present and future.We are deeply grateful for your service! Last month, Garfield hosted a red-carpet soiree for Telecare’s 50th anniversary. Staff munched on a great buffet and delicious cake, played Telecare Trivia, and watched the 50th commemorative video, as well as one put together by staff for a special occasion. Garfield’s many longevity employees got up to say a few words, followed by a touching speech from Regional Administrator Kier Taylor who spoke on the random acts of kindness he sees from staff daily. Thank you to Reiko Takaishi and Garfield staff for throwing a fabulous party! Gladman MHRC celebrated Telecare’s 50th Anniversary with a big party in their back yard. The entire Gladman crew set up a fantastic party that included a live band, fun party games, and face painting! A big thank you to the dietary team at Gladman and the amazing job they did whipping up burgers and hot dogs in a flash! They catered the entire party and served some delicious food for all to share. Check out a glimpse of the activities below. Sausal Creek Parties at the Ballpark! Sausal Creek staff and their family members celebrated Telecare’s 50th birthday by taking it out to the ballgame! On July 19th, staff had the pleasure of watching the Oakland A’s hit home run after home run while playing the Minnesota Twins. Final Score: a whopping 14-1 victory!! It has been a year of many transitions at Sausal Creek as they said good-bye to the long-time leadership team of Pansy Taft-Butkowski (Administrator) and Sabrina Spellman (BOM/HR/AA). Pansy and Sabrina have moved onto other positions within the organization and Carolyn Rapier (former Administrator for Cordilleras) is now leading the Sausal Creek team into Telecare’s next half century! Santa Cruz PHF and CSP Celebrate Telecare’s 50th! 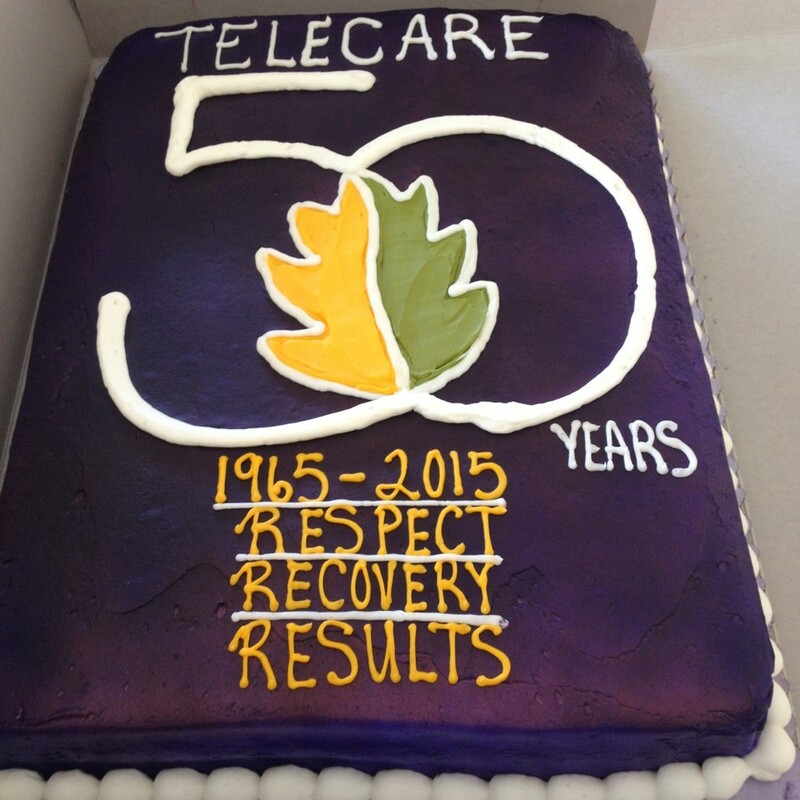 On July 17, 2015, Santa Cruz Psychiatric Health Facility and Crisis Stabilization Program celebrated Telecare’s 50th anniversary by hosting a big party at the facility. The festivities included a BBQ with wonderful food and treats. Telecare employees and County related staff and visitors attended. The theme of the celebration was Community Awareness and how Telecare can make a difference in Santa Cruz County. Thank you Mark Kik for planning and cooking, and everyone who made this celebration a success! Telecare at San Diego NAMI Walk! May is Mental Health Awareness Month, and with it comes a slew of NAMI walks all around the country. Staff, members, family, friends, and more all come out for this great event that draws thousands to walk in support of the ones they love. Thank you to the Telecare San Diego team for getting a big group together and supporting a great event that makes a big difference in the communities we serve! If you have any photos or stories from your local NAMI walk and want to share them on T-Net, send them to the communications team at communications@telecarecorp.com. If you’re in the Bay Area, don’t forget the Bay Area NAMI Walk is on Saturday, May 30th in Golden Gate Park! Earlier this month, the San Bernardino FACT and CORE programs had their annual staff retreat. Under the leadership of our administrator, Debra Evans, we got to spend the day on Catalina Island. The day started in Newport Beach where we boarded the Catalina Flyer for a quick trip to the island. Once there, we had a team building exercise that was not only fun, but very educational. We completed an adventure quest that took us around the island looking for clues and retrieving answers to a list of questions. We had lunch at a local restaurant and then took a fun submarine ride around the island where we were able to encounter the local marine life and learn more about the beautiful island. For the past two years, Garfield has partnered with a local middle school in East Oakland to bring in entertainment for the residents. These middle school students read poetry, play piano, sing, show art work and write personalized letters to our residents. Garfield staff speak with the students about healthcare careers and working with people with mental illness.